The first thing I noticed in Tucson was prickly pear cactus. It looked like bunches of lollipops. They were all over. Tucson, with its sculpted mountains and cactus statues everywhere I turned, was like no place I could remember. The desert, the canyons, saguaro, and javelinas; it was all strange territory. The event that brought me to Tucson was almost as foreign as the landscape: my cousin’s daughter’s bat mitzvah, a coming-of-age celebration in the Jewish religion. Religion and bar mitzvahs have little to do with my life. Years back, I had tried to give religion to my children, wanting them to have what I did not. But those days were long gone. My daughter gone, my son going off to lands stranger than this, I’d forgotten their bat and bar mitzvahs. I was in Tucson for my Aunt Terri and my cousins. And I was excited about the hike I would take, meeting up with friends from Ithaca who would show me mountains up close, and canyons. There was the promise of sunshine, temperatures in the 70s, tamales, good Mexican food. Tucson might be the place I’d retire to someday. I had only happy thoughts. Maybe it was the passage that the bat mitzvah girl read, an old favorite of my kids’, about the Nile River spewing frogs all over Egypt. Or maybe it was when the lollipop cactus started to look like bouquets of flattened balloons deflating, falling to the ground. Or the sight of the girl’s long hair pulled back revealing tiny earrings, the lace on her princess-perfect dress, the bright thirteen-year-old smile. Maybe, when the cacti began to resemble carousing dancers, I started to notice the prickly thorns. Soon thorns were stinging my eyes, grinding in my stomach, all over, everywhere. So by the time the crowd cheered and lifted the girl high up in her chair over their heads, something in me burst. I dashed off, frantically running out, away, fast, anywhere. Outside there was blinding sunshine. The sky was vast and blue. My feet stopped at the edge of a small ravine and I howled for who knows how long. Riots of lollipop cactus hugged the ground around me. I photographed them as I waited for my eyes to lose their red grief-struck look. Damn. Darn, I thought. Good thing I wasn’t wearing eye makeup. It seems, no matter where I go, sweet memories of my daughter will follow. What strange things have triggered your emotions? 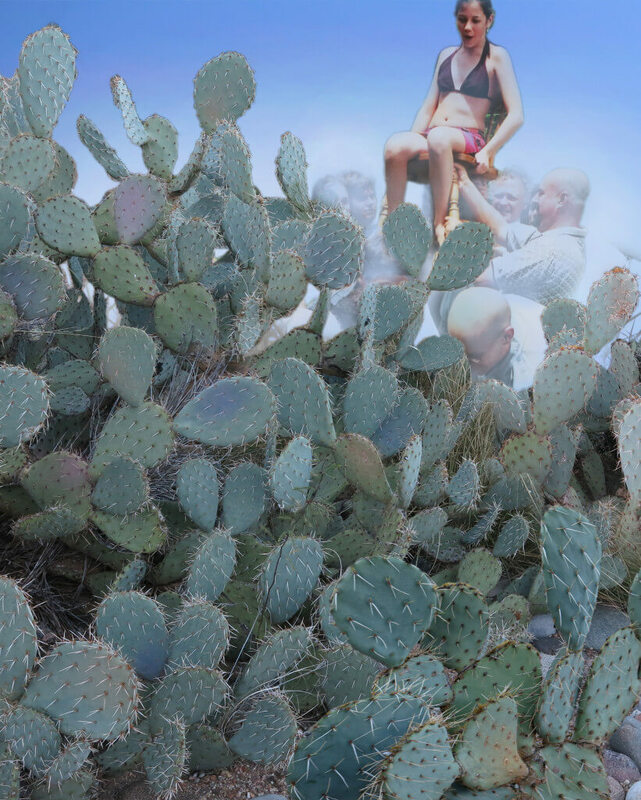 This entry was posted in 2015 and tagged bat mitzvah, coping with memories, foreign landscape, memory triggers, prickly pears, thorns, Tucson on 2015/01/26 by Robin Botie.